DRAW was officially organized following a successful fund-raiser in 1984 for Shirley Muldowney. Members of the drag racing community handling the recovery fund were very encouraged by the support of racers and fans who generously donated. They asked the question , "If we can help one racer, why not organize our efforts to help all injured drag racers?" As a result DRAW was created to provide financial and/or emotional support to injured drag racers. DRAW reaches out to every drag racing category and all drag racing sanctioning bodies. DRAW is a volunteer organization. Office work is done from the businesses and homes of the volunteers. Anyone, racers, fans, sponsors, manufacturers, team and track owners, and more can become involved in DRAW. Sometimes, the most wonderful things have humble beginnings and such is the case with a very special bear named WARD. In 1991, Area 3 DRAW member, Minerva Evans, handcrafted a lovely bear for a special racing friend. 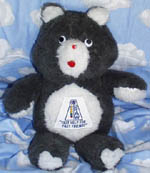 This original bear so delighted Minerva's friend that the friend placed the bear in her race car every time she competed. One day, Minerva's proud friend showed her special bear to DRAW's Board of Trustees. An idea blossomed. Why not present injured racers with a bear when an incident occurs? While DRAW's main emphasis is financial assistance, emotional support is also very important. This new bear was to become a symbol of DRAW's presence and concern, a true gesture of kindness in the aftermath of a racing incident. Much to the board's surprise, Minerva Evans volunteered to make the bears, cuddly little creatures that would eventually find their way into the arms of racers touched by injury. Everyone got excited about DRAW's new idea and the board decided to hold a contest to come up with just the right Bear name. While creativity abound as names poured in, when all was said and done, one clearly became the favorite. It was simply . . . . WARD. While not a popular or common name in the 90's, it was just perfect for this bear . . . . It's DRAW spelled backWARD! Over the years, Minerva Evans painstakingly stitched dozens of bears that touched the lives of many a racer. Sometimes, WARD went through the mail but the preferred method of delivery was for a DRAW member to present him in person. Whenever possible, Board Members, Area Coordinators or DRAW Members would visit injured racers immediately following an incident, often going to the hospital to comfort the family, offer support and bring WARD. So popular and adored was WARD, legend grew it wasn't stuffing that made him cuddly, but the love Minerva filled him with. On Saturday May 10th, 1997, Minerva Evan's life was irrevocably changed when her husband, Ray, was critically injured during a top-end incident in Illinois, leaving him paralyzed from the chest down. Minerva remained at Ray's side throughout his long hospitalization, not returning home, even once, until March of 1998. DRAW and hundreds in the racing community stepped forWARD to assist the family during this difficult time. Obviously the focus and priorities in Minerva's life were now centered on her husband's medical care, thus with great sadness Minerva relinquished her sewing duties to care for the man she loved, marking the end of an era for the original, magical WARD. In the years immediately following Minerva's decision, DRAW experimented with a number of options to fill the gap. As is often the case, sometimes one doesn't truly appreciate the fullness of something until it's lost. Nowhere was that more apparent than when DRAW attempted to find someone to replace Minerva in the construction of WARD Bears. It slowly dawned on everyone that Minerva had indeed, given a very special contribution with WARD, evidently one not easily replaced. In 2000, DRAW celebrates the life and memory of the original WARD Bear with the introduction of a new WARD. While DRAW's new bear is "factory model", we've added personal touches that officially transform him into our very own second-generation WARD. And in a tradition started by Minerva, each WARD Bear is sprinkled with kisses and showered with love by the last DRAW member to hold him, then sent on his way to give comfort . . and remind each special racer touched by an unexpected incident or loss, that they are not alone.